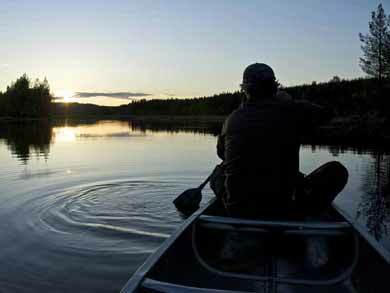 The following article compares our range of self-guided canoe tours in Sweden and Finland. These tours feature wild camping (sometimes at designated locations depending on the area) all along the route. Many of our log cabin experiences also offer very good opportunities for canoeing day tours from fixed cabin base. In addition to the tours outlined below, all of which are based on wild camping and self-guided, we also offer Stockholm Lakeland Canoe Explorer (with hostel and B&B accommodation). Sweden and Finland are an ideal destinations for a canoeing holiday. Whether you are planning to travel with a loved one, as a family with children, or with friends and colleagues from work or a local canoe club, their huge systems of waterways offers endless possibilities for paddling holiday adventures. Nature Travels offers canoeing holidays in Sweden and Finland to suit both novice canoeists and more experienced paddlers, with tours available from 4 days to 14 days. Nature Travels canoe tours are self-guided experiences, voyages of discovery taken at your own pace. The waters may be calm and the surroundings peaceful, but there is a real sense of adventure even on our most accessible routes. You plan your distance each day and choose your own camping spot each night. Thanks to the Right of Public Access in Sweden and Finland, wild camping is possible on all routes, which makes for a true outdoor canoeing experience. Depending on the duration and length of your tour, you can take time out to go for day hikes in the surrounding forest or explore side-streams and tributaries along the way. Along the way, you are free to let the rhythm of your days unfold in any way you wish, making some days into a challenge or taking time to relax and enjoy the beautiful surroundings. Nature Travels canoe holidays in Sweden take place in rural Skåne in the far south, in the beautiful province of Värmland in western Sweden, in the extensive lake network of Dalsland and in the challenging wilderness region of Rogen in the north-west, and in Finland in the province of Kainuu near the Russian border and in the Linnansaari and Kolovesi National Parks in the east of the country. 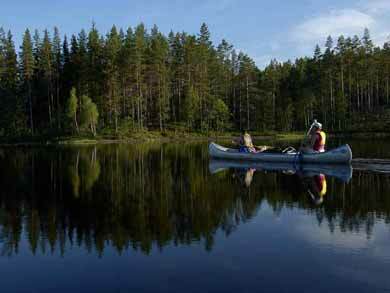 Värmland's terrain is ideally suited to self-guided canoe tours. The waters are calm and slow-flowing, and there is a vast network of lakes and rivers to explore. Värmland offers an excellent combination of accessibility and remote landscapes, and you can choose to go canoeing through picturesque rural landscapes, taking breaks at local stores along the way to pick up supplies or visit cultural attractions, or alternatively you can make your canoeing holiday more of a wilderness experience. Dalsland is one of Sweden's best known areas for canoeing, with a well-organised system of overnight camp spots and a large area to explore, and a combination of rural and more remote landscapes. Skåne, Sweden's most southerly county, offers an attractive rural landscape ideal for leisurely canoe tours and is very easily accessible from nearby Copenhagen. For those with suitable outdoor experience seeking a true wilderness paddle tour, our tours in Rogen and its sister reserve Femundsmarka on the Norwegian side offer a chance for canoeing adventures in a landscape of low mountains, moorland and ancient forest through a beautiful patchwork of lakes connected by rivers. Canoeing in Sweden and Finland gives you the possibility for up-close encounters with the rich and varied wildlife. While Nordic wildlife can be shy and hard to see, you have a good chance of spotting some of the many beaver which inhabit the waterways along some of the routes of our Värmland tours as they cut gracefully through the water with just their heads visible above the surface. It is not uncommon to encounter beaver at very close range during one of our canoeing holidays - perhaps just a few metres from your canoe. There is also a host of wildlife inhabiting the dense forests past which you will be paddling. As you round a bend in the river, you may spot an elk and her calf drinking by the river bank, or even strking out powerfully in the water as they head for the opposite bank (elk are excellent swimmers! ), while the skies above you are home to eagles and buzzards. Despite the remoteness of some of the tours and the possibility of a true get-away-from-it-all canoeing experience, you do not need to be an experienced paddler to go on one of our canoeing holidays. Provided that you are used to camping, enjoy life in the outdoors and are reasonably fit, you will find the tours enjoyable and accessible. For safety reasons, a minimum of 2 adults are normally required for each of the canoe tours, though some of the more accessible tours can also be suitable for solo adult with child(ren). The tours are also ideal for small or large groups, and for larger groups (such as scouts, school groups or Armed Forces Adventurous Training), a group discount is often possible. Included in the price of your canoeing holiday is all equipment necessary for your trip, including 2-3 person Canadian canoes, paddles and buoyancy aids as well as local transfers to/from start/end points as required. Cooking equipment and/or camping equipment may also be included as standard or available to hire as an optional extra depending on the tour, and in some cases a food package is also available as an extra or included - please see the tour information for your chosen experience under "What's included" for more information. For some canoe tours requiring land transports, a canoe trolley is included to assist with these (except for tours in Rogen where the terrain is unsuitable and canoes must be carried). 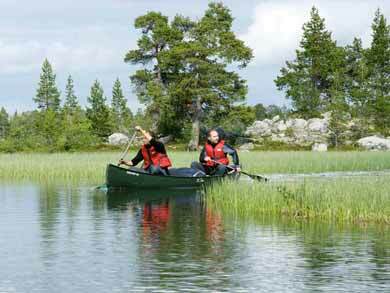 Canoeing is a marvellous way to experience the Nordic countries' truly wild places. Whatever your level of experience, age, or the composition and size of your group, Sweden and Finland offer wonderful opportunities for true nature experiences by canoe. We have divided the tours into "Rural", "Remote" and "Wilderness", which indicates not only the landscape to expect but also the level of challenge - the most remote tours will also be the most challenging! All tours are based on wild camping and fishing is possible for all the routes, with fishing licence(s) purchased locally. Don't forget that we also offer Stockholm Lakeland Canoe Explorer (with hostel and B&B accommodation). Of our four canoeing holidays running in scenic rural locations, Canoe on Klarälven and Canoe on Röjdån (in Värmland in the west of Sweden) and Canoe Getaway in Skåne (in the south) are suitable for all ages and levels of experience (including for solo adults travelling with children - please contact us for details). Even if you have never been canoeing before or have limited experience of the outdoors, these tours are accessible to anyone who enjoys outdoor life with a reasonable level of fitness and give you an opportunity to experience the tranquility and adventure of a paddling holiday in Sweden! Canoeing in Dalsland's Lake District is also a very accessible tour, but with the paddling taking place more in a lakeland landscape, where windy conditions can add to the level of challenge. Canoe Getaway in Skåne is a 4-day tour with flexible start days and a long season, being possible from the beginning of May even into October. Beginning with a river section opening into the Lake Ivo archipelago, the tour also offers great flexibility in terms of distance and level of challenge - you can explore as much or as little of the lake system as you wish in the time available. The minimum distance is just 12km, but the lake system offers the possibility to paddle much further if you wish. This area is also very good for fishing and is ideal for both families and adults looking for a short canoe break. Canoe on Röjdån is a 4-day tour which runs in a cultural landscape and is the only one of our tours which is a "there and back" route. The tour starts from the small town of Torsby and after canoeing to lake Kläggen you return to Torsby again - 45km of relaxing canoeing and two short land transports in each direction. There are limited places to shop on this tour, so we recommend you bring all your food with you. Canoe on Röjdån is suitable for the whole family and is ideal for younger children. The tour is possible on standard dates all the way from May to September, making it a good choice if just two persons in the early or later parts of the season. Canoe on Klarälven is also an ideal canoeing holiday for families and is available in 4-day (50km) or 7-day (100km) variations. This tour takes you through an attractive rural landscape along the wide, slow-flowing waters of the Klarälven river. The Klarälven area is also the location for our popular timber rafting experiences. Along the way there are small villages and cultural attractions and opportunities to stop and shop. As for all our canoe tours, the tour is based on wild camping, or for the Klarälven tour you may choose to spend a night or two at "proper" campsites along the river bank (additional charge payable locally). As you canoe downstream (the Klarälven flows gently at around 2kph) for the whole of the tour, this is the most accessible of all our canoe tours in terms of level of challenge, but is nevertheless a popular choice for a wide range of participants, from families to adult groups. Canoeing in Dalsland's Lake District is flexible tour duration 4-8 days through a beautiful system of lakes in West Sweden. This is the most challenging of the rural tours listed here, and is suitable for both adults and active families. Many of the lakes are connected by locks and you will pass some small villages along the route with stores where you can top up provisions, etc, if required. Some land transports are also required (a canoe trolley is included). The Dalsland lake area also offers wonderful opportunities for more remote paddling, and the flexible nature of this tour means that you can choose to vary and extend the planned route to increase the level of challenge and distance covered if you wish. Unlike our other canoe tours, camping is at designated overnight spots, where fireplaces/wood and dry outdoor toilets are provided. There is a network of such spots in the Dalsland lake system, any of which can be used depending on how you plan your tour. 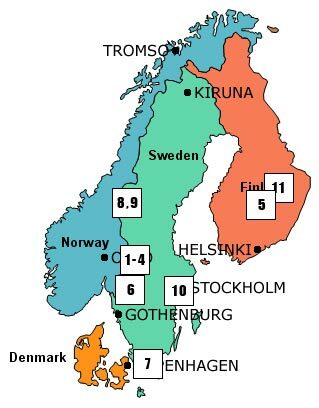 The Dalsland tour is possible on flexible start dates throughout the season. The tours listed below occupy the "middle ground" in terms of remoteness, and are a very popular choice for paddlers wanting a wilder landscape compared to a rural tour but a little more accessible than those in our "wilderness" category. These tours can also offer a real wilderness feeling during parts of the route. The Swedish tours in this category are in the counties of Värmland and Dalsland in the west of Sweden, while Canoeing on the Tar Route in Kainuu and Canoe or Kayak in Linnansaari National Park are located in eastern Finland. Canoeing on the Tar Route in Kainuu is a 7-day tour and is in some ways comparable to our Canoeing in Dalsland's Lake District (Sweden), offering a beautiful lakeland network to paddle through and explore at your own pace. Camping is at a choice of designated camp spots, where firewood is provided, and the area offers great flexibility to vary the distance covered and level of challenge depending on your wishes. All camping equipment is provided as standard. As much of the tour takes place in a protected area, the landscape offers a lovely remote atmosphere during many parts of the tour, with only a few settlements/houses along the route. This tour is ideal for adults or active families (recommended min. age 12). Canoe or Kayak in Linnansaari National Park is a flexible experience combining 2 nights in eco studio apartment at the start/end of the tour with 4 or more days' paddling in the stunning lakeland archipelago landscpae in and around Linnansaari National Park. Additional days can be added to make the tour as long as you wish. Choose between 2-person Canadian canoes, double kayaks or single kayaks. There is a network of designated camping spots within the National Park where fireplaces and outdoor toilets are provided. Outside the park boundaries there is greater freedom for choice of overnight campspot following the guidelines of the Finnish Right of Public Access. This tour is suitable for adults and families provided all children are able to swim. Canoe on Rottnan is a 4-day tour taking you through a lovely area of forests and lakes, a fairly remote landscape yet a very accessible tour for a wide range of participants, including families. Opportunities to shop along the route are limited and it is recommended that you bring all your food with you. No land transports are required, making Canoe on Rottnan an ideal canoeing holiday for those who want to experience the beauty and silence of a more remote tour but with reduced level of challenge. Total distance covered is around 35km and is easily paddled in the time available. For a longer tour, our extended canoeing holiday experiences in this region are Canoe Tours on Svartälven (4 or 7 days) and Canoe Tours in Bergslagen (5 days). These tours require land transports (most challenging for the Bergslagen tour) with canoe trolley provided to assist with these. The standard routes can be extended to some degree by planning your own detours into side lake and river systems. Canoe on Svartälven is an excellent choice for a remote canoeing holiday which is nevertheless accessible to a wide range of participants and is a popular option for couples, adults with older children, and groups. This tour is a combination of river paddling (on flat water) with the last section of the route leading through a series of lakes. The canoe tour involves 10 land crossings and 1 lift, the longest crossing being 2km. Though not as demanding a canoeing holiday as the Bergslagen tour, Canoe on Svartälven can be challenging for children under 10 years of age. There are limited places to shop while on this tour, although provisions are available at a small village approximately two-thirds of the way along the 7-day route. Total distance covered is around 35-40km (4 days) or 75km (7 days), though this can easily be extended if you wish by planning extensions to the basic route. 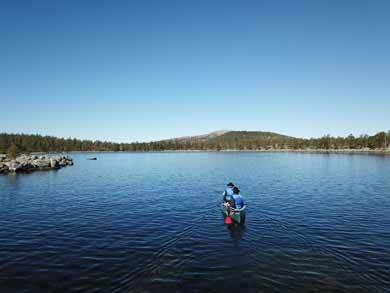 Canoe in Bergslagen is a remote tour with areas which offer a real wilderness feeling, taking you through a network of lakes. There are a number of land transports along the route, the longest of which is around 4km. 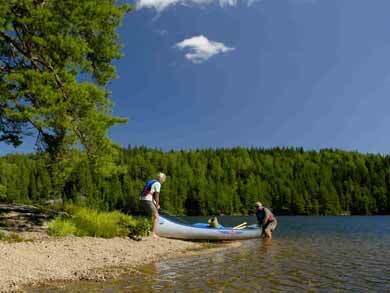 Canoe in Bergslagen is an ideal tour for those with a general good level of physical fitness and seeking a moderately challenging remote canoeing experience, covering a distance of around 52km. The tour is most suitable for adults but can also be an option for families with older children. There are no shops in the area and it is necessary to bring all the food you will need with you. Located in the mountain area of north-west Sweden, the largely pathless wilderness of Rogen Nature Reserve and its partner on the Norwegian side, Femundsmarka National Park, is an exciting and beautiful area ideal for challenging wilderness canoeing. These tours run in a remote wilderness region with no infrastructure and limited access, so if you are considering one of our tours in this area it is important that you are able to handle yourself confidently in the outdoors and have a good level of fitness. There are a number of land transports required, and unlike for tours in regions where a canoe trolley can be used, in Rogen the canoes and all equipment must carried, often over rocky and uneven terrain - this can be challenging. Tours in Rogen are wild camping, but as a protected area, camp fires are only permitted at designated spots. When canoeing in Rogen, it is more helpful to think in terms of time than distance, as weather conditions, number of land transports, etc, will significantly affect the distance paddled on a particular day. Rogen is also wonderful for hiking, so why not plan a few extra days into your itinerary to do some day hikes from a base camp? 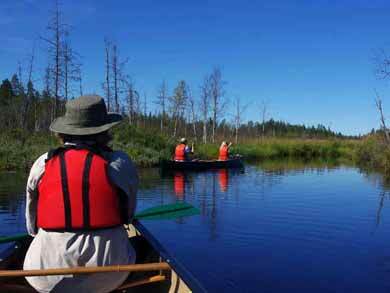 There are two main options available - Discover Wilderness Canoeing in Rogen and Rogen Wilderness Canoe Expedition~. In both cases you are canoeing in the Rogen reserve - both tours start in the same part of the reserve. For the Expedition, you are committed to covering a particular distance in the time available to reach the end point, and will of course travel deeper into the reserve and right across to the other side to end in Norway. The Discover tour gives you the flexibility to explore as much of the reserve as you wish in the time available, but without the very challenging stretch of land transports along Röa river required for the Expedition and without the commitment to reach a particular point. Discover Wilderness Canoeing in Rogen is the more accessible of the two, suitable for adults or active families with older children who are confident in the outdoors. 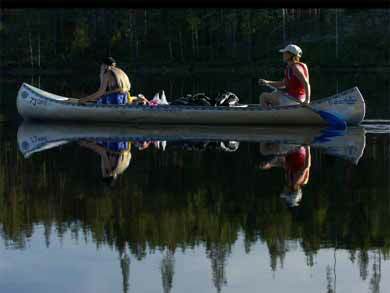 This wilderness canoe tour offers a great deal of flexibility in terms of the level of challenge and distance covered. There is a choice of three start/end combinations, two routes which start and end at the same points (giving you the greatest flexibility to explore as much or as little of the reserve as you wish depending on time, weather conditions and energy levels), and one "A to B" option, which requires covering a minimum distance with additional distance flexible. The number and length of land transports required will vary depending on which route is chosen and what areas of the reserve you choose to explore. Recommended duration is 4-8 days, but you are welcome to add any number of additional days if you would like to extend your paddle tour. The reserve offers excellent fishing and the flexibility of the tour gives you considerable freedom to plan your own route and create your own adventure. Rogen Wilderness Canoe Expedition is the more challenging option and is suitable only for those with extensive outdoor experience and previous experience of canoe tours. Over 8-14 days the tour takes you from Rogen across into Femundsmarka on the Norwegian side with a choice of two pick-up points in Norway. This is a real wilderness challenge and a great adventure. A number of extended portages are required over rough terrain, but the stunning scenery, marvellous fishing and unique experience of canoeing in a very remote area will be ample reward for your efforts! All information, products and prices on this website are subject to change without notice.